When setting up an event with TeeTimeHelper we estimated that the default interval between tee times was ten minutes. Now that TeeTimeHelper has been organizing events for over 5 yeas we sampled our data to find out what was the most common tee time interval. 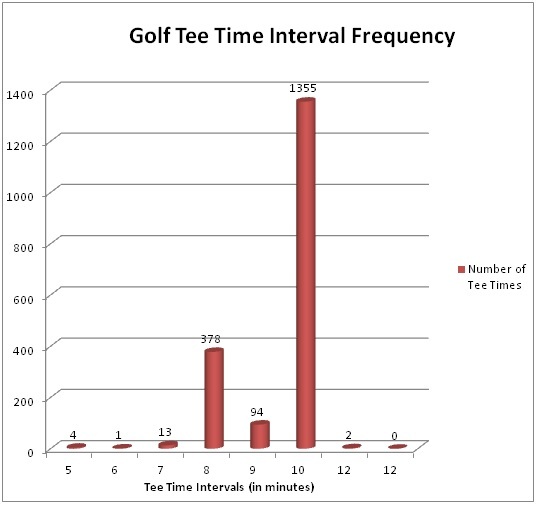 It turns out that our initial default value of ten minutes was the most common tee time increment used on our site. The second most common tee time increment is eight minutes, with nine minutes coming in third. Given that tee time increments can vary TeeTimeHelper automatically determines your tee time interval based on previous events you have organized. This means if you set up a tee time at 10:10 am and a second tee time at 10:08 TeeTimeHelper will remember this course setting and will give you an eight minute increment in the future. TeeTimeHelper also pre-fills your first tee time on subsequent events to save some keystrokes if you play at a regular time. These little enhancements for setting up events will help the golf group manager organizer golf events faster.